. Published on March 21, 2016 . I’m one of those people who can barely stand to look at photos of themselves, much less videos. But I forced myself to watch this, and I think it’s not too bad. Still, as someone who much prefers to express himself in writing, I thought it might be worthwhile including my written responses to the questions they asked me in this video. Summarize your book in one sentence. 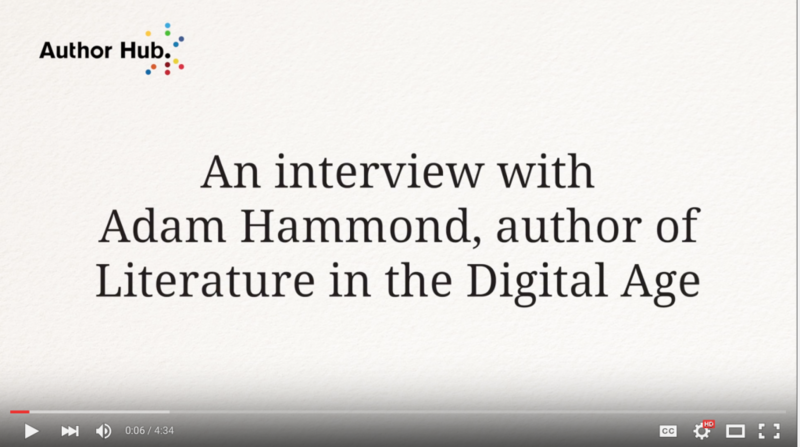 My book argues that the collision of digital and printed forms of literature shouldn’t be seen as a catastrophe but as a huge opportunity to re-assess and re-evaluate all that literature has meant to us, all it means today, and how it will evolve in the future. Print and the digital aren’t in opposition; they’re in conversation — and it’s a conversation that literary scholars and students of every level of technical expertise need to get involved in. What is Digital Humanities, and how has it changed the way the humanities are studied? The broadest definition of DH is humanities research and teaching carried out with and through digital texts and resources. By that definition, everyone involved in the humanities is a digital humanist. Skeptics respond to this definition by asking what the big deal is, or what’s changed. By this definition, DH changes nothing. The narrowest definition of DH is a field concerned with developing new computational approaches to storing, classifying, and analyzing humanities materials. By that definition, you need to be extremely skilled in computational methodologies — an expert coder — to be a digital humanist. Skeptics respond to this by stating that DH is trying to turn the humanities into another branch of the sciences, and that this is dangerous because scientific approaches seek absolute truth whereas humanities approaches seek complexity. By this definition, DH changes everything. I think the truth is somewhere in between. DH doesn’t change the fundamentals of what we do and what we study. We’re still historians or philosophers or literary critics. We still seek complexity. But DH changes how we work. A Blake scholar with instant access to every version of every page of his works in illuminated printing works differently than a Blake scholar who would have to spend a lifetime to see all these works. A Blake scholar who shares her latest discovery on Twitter works differently than one who publishes an article in an expensive, low-circulation print journal every few years. A Blake scholar who collaborates with a computer scientist to track his influence on twenty-first century poetry works differently than one who works in solitude. It can change what we study. In the era of videogames and digital storytelling, literature appears in unfamiliar forms. When writers publish digital add-ons to print novels, Twitter sequels to paperbacks, literary critics need to re-assess the boundaries of their objects of study. It can allow us to ask new questions. No human being could read all the novels every published. This limitation means that literary scholars have looked at only a miniscule fraction of the total literary sphere. But a critic could write an algorithm that could ask a research question across thousands and millions of digitized texts instantaneously. And it changes the training we provide our students. If digital analysis is a key aspect of literary inquiry going forward, we need to teach our students statistics and programming. If collaboration is an increasingly important part of the field, we need to assign more team-based projects. If literary expression is increasingly happening digitally, we need to teach our students the tools for expressing themselves digitally. What would you say is the place of literature in this growing field? Literature has taken a leading role in DH. Partly this is because text is easy to digitize — easier than music or still or moving images — and easy to analyze computationally. Partly it’s because literature departments have traditionally been very attentive to the role of technologies in shaping human thought and patterns of behavior. It was an English professor, Marshall McLuhan, who said “the medium is the message.” And partly it’s because literature departments are under pressure. With diminishing enrollments, we’ve needed to find new ways to make ourselves relevant to our students’ lives, and DH has been a big part of that. Was there anything that really surprised you when you were writing this introduction? First of all, I was surprised that no book like this already exists. There are lots of broad introductions to DH. There are lots and lots of books in which scholars tell other scholars about the significance about DH, or its insignificance, or the directions it should take, and how it needs to improve. But there is no book that looks at how the digital world is changing this specific field of literary studies, and is pitched broadly at undergraduates, graduate students, and faculty. I was surprised at how awesome recent videogames — especially independent videogames — are, and surprised at how slow we’ve been to recognize the videogame as a literary form and a vehicle for narrative. Literature scholars were at the forefront of theorizing the new possibilities for narrative that digital forms propose, but retreated from view when videogames stopped being text-based and started to look increasingly like interactive movies. We need to get back into that conversation. What do you think the future holds for digital literary studies? The distinction between literary studies and digital literary studies will dissolve. We’ll stop thinking of Digital Humanists as a separate breed. We’ll keep focusing on the kinds of questions that have always interested us, but we’ll investigate them with increasingly sophisticated digital methods. We’ll collaborate more with other disciplines. We’ll be more open and accessible as a discipline — more engaged with the public, more engaging to the public. The history of literature won’t change, but we’ll understand it differently. And we’ll study connections between literature and a variety of digital-native forms. The most dramatic changes will be in the classroom. We’ll spend more time teaching our students the skills of digital literacy they need to engage critically with literature in the digital age: coding, programming, statistics, media theory. Students will make more than essays. Graduates of literature programs will be game developers and pioneers in expressive programming. I taped this video in the CUP offices in New York. I woke up at 4am PST that day to catch a 6:30am flight that arrived at LaGuardia a little before 3pm. I then rushed to the CUP offices, arriving half an hour late, at 4:30pm. We just managed to tape the interview before the office closed at 5pm. Since I’d written out my responses on the flight, this interview is a lot of me trying to remember what I’d written rather than just thinking off the top of my head. But so it goes. Also: Do I really look that much like Colin Jost?